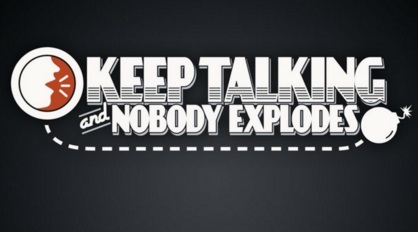 Intro: In Keep Talking and Nobody Explodes, one player is trapped in a virtual room with a ticking time bomb they must defuse. The other players are the “Experts” who must give the instructions to defuse the bomb by deciphering the information found in the bomb defusal manual. But there’s a catch: the experts can’t see the bomb, so everyone will need to talk it out – fast! Review: The idea of this game is simple. You need at least 2 people. One will be the “bomb defuser” and the other will be the “bomb expert”. The bomb defuser has to defuse the bomb in time as well as performing quite a few other tasks at a later stage. The bomb expert knows all there is to know about bombs and will tell them how to defuse it (thanks to the manual you have to download and preferably print). Cut the red wire, cut the while wire, things like that. The problem is the bomb expert can’t see the bomb! So they have to rely on the descriptive capabilities of the bomb defuser. This often leads to chaos, shouting and extreme fun. In truth is whoever plays this game it always goes to pot pretty quick and that is where the hilarity starts to unfold. Daft descriptions, panic searching of defusing instructions and plain old confusion are all the order of the day. Most people should be able to get through the first ten bombs pretty easily, but beyond that, things get harder and harder. More components to the bomb, more frantic searching of the instructions, which leads to the timer getting lower and lower. This is not a game born from the mind of a gamer, it is born from the mind of a madman that just happens to be a pure genius. Verdict: Having played the normal PC version a few times I can tell you the VR version is a lot more fun. This is a great game to play in any format, on any system. But in VR you got that sense of being alone with only a voice guiding you to defuse the bomb which made it strangely scary and quite lonely at times. While it is not something you can play on your own, it is the ultimate party game, play with friends, play with family and watch them all crumble and fall apart in the end with stress. I couldn’t recommend it enough.